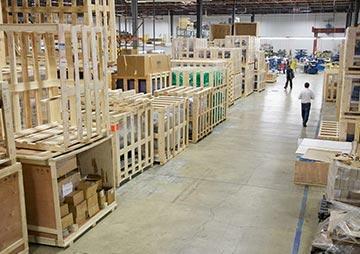 M&R puts the same effort into packaging equipment for shipment as it does in designing and building it. Domestic or land shipments are bolted to heavy-duty skids, covered with thick poly sheeting, and protected with a sturdy wooden “cage” crate. Equipment destined for shipment by sea is given a greater level of attention. Wrapped in a heavy duty protective air tight poly sheeting with dry packs, then shrink wrapped and crated to ensure it arrives in the same pristine shape as when It left the M&R factory.